This is the category for the Romani, an ethnic group also called by a variety of other names, including Roma and Gypsies. 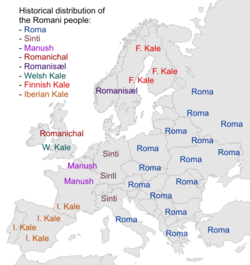 See Wikipedia article Names of the Romani people. Pages in category "Romani people"
This page was last edited on 8 August 2015, at 12:57.